I love making cupcakes. I have made dozens and dozens of cupcakes since receiving my artisan stand mixer as an engagement gift. I have experimented with different flavors of cupcakes and icings, as well as different colors for the icings (from mango to chocolate cherry to coconut to mexican chocolate to vanilla). If there's any food I like, I will put it in a cupcake. I have always been fascinated with cupcakes since I was a kid - they're cute, sweet and oh so pretty - a little girl's favorite dessert. I have studied various recipes from different cupcake chefs over the last few years (Martha Stewart Julie Hasson and Magnolia Bake Shop in particular). 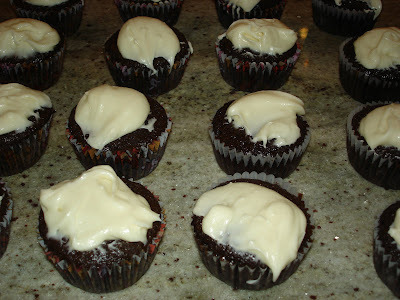 The problem with many cupcakes is that often times the cupcake itself is overpoweringly rich (especially the case with chocolate cupcakes) or that the frosting is overly sweet so that you can't have more than a bite. What I am striving for is a cupcake that you can eat and enjoy without feeling overpowered by the flavors in the cupcake (note: this does not mean that the cupcake doesn't contain tremendous amounts of butter and sugar). Who would have thought that the very best cupcake I ever made would involve pouring an entire beer into the cupcake mix? If I told you I made something that required mixing beer, eggs and butter, you would probably laugh at me and tell me how disgusting that sounded. But the truth is, it is the perfect combination for an amazing chocolate cupcake. With respect to the icing, I always make my own icing recipes at the last minute on the fly - most of the time they work out and this one was a success. For tonight's recipe, I decided to incorporate some honey in the cupcake icing. I read about a different, but really great cupcake recipe on the white house food blog (which I plan on making at some point). What caught my eye was that they have been using a lot of honey in their baking by utilizing the White House beehive. This made be consider incorporating honey into my vanilla icing for the cupcakes. Just an aside here - the White House Beehive must be a new thing under the Obama administration (along with the well reported on vegetable garden), as I keep getting this image of George Bush accidentally stumbling into the beehive and getting chased by a swarm of angry yellow jackets. I'm sorry, I can't help it. To read more about backyard beekeeping at the White House as a culinary adventure, click here. The foodie focus of the current White House is a current interest of mine that may periodically appear in my articles. To make the cupcakes, I first combined the dry ingredients (the cocoa, flour, baking soda and salt). Then in a separate bowl, I combined the beer with the stick of butter that I had melted first in the microwave. After you do this, the mixture will look absolutely disgusting and may even curdle (mine did). Persevere and don't worry about this, as it will turn out all right in the end. Then add the vanilla and the three eggs, one at a time. Next mix in the sour cream until fully combined. Next, slowly add the dry ingredients and mix well. At this point the batter should look and taste delicious. Bake the cupcakes about 25 minutes at 350 degrees F after filling about 24 cups 3/4 of the way to the top. I love using silicon cupcake trays, which I line with cupcake liners. These can be purchased almost anywhere, these days, and are an essential addition to the kitchen if any aspiring baker. I registered for both silicon cupcake trays and silicon loaf pans when I got married a few years ago and it has made baking a wonderful experience. The cupcakes should rise nicely and you can test the inside with a fork or toothpick to make sure they are done. Then allow them to cool completely before frosting them. 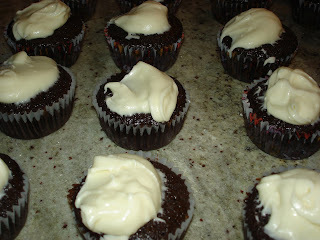 The icing recipe is something I whipped up tonight on the spot that worked beautifully with these cupcakes. First I whipped the cream cheese and butter in the mixer until combined. Then I added the entire box (yes, you really do need to use the entire 1 LB box, which I why I don't eat or make cupcakes every day) of confectioner's sugar. 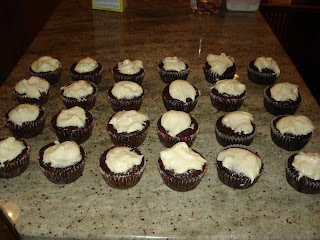 Then to thin the cupcakes to make a better tasting, smoother frosting slowly add heavy cream while the mixer is running. I added somewhere between 1/3 and 1/2 a cup of heavy cream. Next add about 1 1/2 teaspoons of vanilla, and finally 2 tablespoons of honey. Just a word of caution, while it is generally a lot of fun to use food colorings to dye your cupcake frosting, I chose to leave this one white. First, I think it accents the chocolate cupcakes nicely. Further, if you are using heavy cream, you cannot use conventional food colorings because it will curdle and ruin your icing (I had a bad experience once with curdling purple cream icing). If you must color this particular frosting, you will need to experiment with various oil-based frostings. I tend to limit my use of colors to a more conventional buttercream and cream cheese icings. These cupcakes were great - the Guinness in the chocolate cupcake is nice but subtle (it won't get you or your kids drunk, as the alcohol is lost in the baking process). The chocolate flavor is therefore less overpowering, which is what I had sought. And it accents nicely with the honey-vanilla icing.